Superman Fan Podcast Episode #268: Free Comic Book Day & Superman Comic Books Cover Dated February 1962: Superman #151 & Action Comics #285! Superman #151 & Action Comics #285! SUPERMAN 151, February 1962, was published around December 19, 1961. It contained 32 pages for the cover price of 12¢. According to Mike’s Amazing World Of DC Comics, its circulation was 820,000. Mort Weisinger was the editor, and the cover was pencilled by Curt Swan and inked by George Klein. All three stories were reprinted in SHOWCASE PRESENTS: SUPERMAN vol. III. – THE THREE TOUGH TEEN-AGERS (9 pgs. ), written by Jerry Siegel and drawn by Al Plastino. This story was Siegel’s 37th silver age Superman story, and his 96th overall for the era. Previously, he wrote BIZARRO CREATES A MONSTER, in ADVENTURE COMICS 292, January 1962, pencilled by John Forte and inked by George Klein. – THE MAN WHO TRAINED SUPERMAN (9 pgs. ),written by Robert Bernstein, pencilled by Curt Swan and inked by George Klein. – SUPERMAN’S GREATEST SECRET (8 pgs. ), written by Jerry Siegel, pencilled by Curt Swan and inked by George Klein. This story was Siegel’s 38th silver age Superman story, and his 97th overall for the era. ACTION COMICS 285, February 1962, was published December 28, 1961. It contained 32 pages for the cover price of 12¢. Mort Weisinger was the editor, and the cover was pencilled by Curt Swan and inked by George Klein. This was Supergirl’s 9th cover appearance for this title. At this point she has also made one appearance on the cover of SUPERMAN. – THE WORLD’S GREATEST HEROINE (the title of the entire story, as well as the 12 page part I.) It was written by Jerry Siegel and drawn by Jim Mooney. This story was Siegel’s 61st silver age Superman Family story, and his 98th overall for the era. Elsewhere in DC Comics 29 titles carried the February or February/March 1962 cover date, according to Mike’s Amazing World Of DC Comics. I also share what I picked up from Free Comic Book Day, as well as a letter that was printed by DC Comics on the inside front cover of all of its titles which carried the February cover date. That almost apologetic letter was an explanation of the reasons DC Comics raised its cover price from a dime to 12¢. Next Episode: SUPERMAN FAMILY COMIC BOOKS COVER DATED MARCH 1959: SUPERMAN’S PAL JIMMY OLSEN 35 & WORLD’S FINEST COMICS 100! In 2 Weeks: SUPERMAN COMIC BOOK COVER DATED MARCH 1962: ACTION COMICS 286! In 3 Weeks: METROPOLIS, HERE WE COME! Superman Fan Podcast Episode #224: Superman Comic Book Cover Dated September 1960: Action Comics #268! ACTION COMICS 268, September 1960, was published around July 28, 1960. It contained 32 pages for the cover price of a dime. Mort Weisinger was the editor, and the cover was pencilled by Curt Swan and inked by Stan Kaye. The Man of Steel starred in the 13 page story, SUPERMAN’S BATTLE WITH HERCULES, written by Otto Binder, pencilled by Wayne Boring and inked by Stan Kaye. This story has been reprinted in SHOWCASE PRESENTS: SUPERMAN vol. II. The Maid of Might starred in the 13 page story, THE MYSTERIOUS SUPERGIRL, written by Jerry Siegel and drawn by Jim Mooney. This story has been reprinted in SUPERGIRL ARCHIVES vol. I and SHOWCASE PRESENTS: SUPERGIRL vol. I. 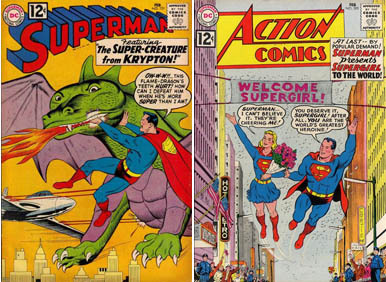 Elsewhere in DC Comics, 29 titles carried the September or September/October 1960 cover date. 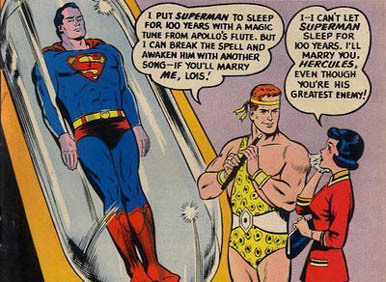 Since this episode features only a single comic book issue, the ads and other features of this issue are highlighted, including the METROPOLIS MAILBAG. Also, Saturday’s FREE COMIC BOOK DAY is previewed. Next Episode: SUPERMAN FAMILY COMIC BOOKS COVER DATED SEPTEMBER 1957: SUPERMAN’S PAL JIMMY OLSEN, SHOWCASE 10 (featuring SUPERMAN’S GIRL FRIEND LOIS LANE) and WORLD’S FINEST COMICS 90! In 2 Weeks” SUPERMAN COMIC BOOKS COVER DATED OCTOBER 1960: SUPERMAN 140 & ACTION COMICS 269! Superman Fan Podcast Episode #125: Happy Birthday, Dennis O’Neil & Free Comic Book Day 2010!